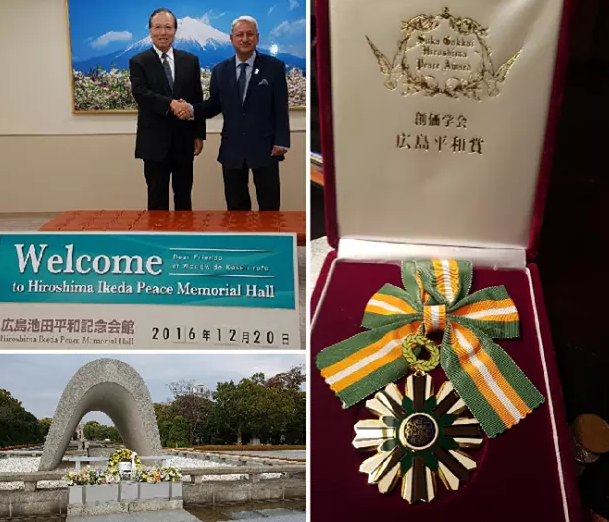 Hiroshima: Dr Anoop Swarup, Centre for Global Nonkilling Chair and Vice Chancellor Jagran Lakecity University in Bhopal received the Soka Gakkai Hiroshima Peace Award at the Hiroshima Ikeda Peace Memorial Hall here on December 20, as a recognition of his dedication and service for a nonkilling world. Dr. Swarup was also invited to deliver the lecture “Give Nonkilling a Chance” at Soka University. On this occasion, he underscored the vision of a “Nonkilling Human Revolution”. A visit to the Hiroshima Peace Memorial and Museum was also arranged, with news coverage by local media. It is a great honour for me to be conferred with the ‘Hiroshima Peace Award’ by the Hiroshima Soka Gakkai and to deliver the 170th Lecture on this momentous occasion. Being in Hiroshima, is not only a remembrance and a pilgrimage to me personally speaking but also a tearful homage to the sacrifice of the innocent and precious lives lost here on that fateful day of 6th of Aug 1945. As described by UNESCO this not only represents “a stark and powerful symbol of the most destructive force ever created by humankind; but more importantly it also expresses the hope for world peace and the ultimate elimination of all nuclear weapons.” I dedicate this Address to that unique cause! At the outset let me reflect on my inspiration, an icon for the entire humanity of this century, Dr Daisaku Ikeda, who’s thought and philosophy I would like to commemorate on this special occasion. A Buddhist philosopher saint, peace builder, educator, author and poet extraordinaire, he as the founding president of the Soka Gakkai International has himself been a changemaker in the 50 years of his Presidency of the Soka Gakkai Buddhist Association from an age of just 32. He has pursued a diverse range of activities in pursuit of global peace and amongst his achievements is the building up of the Soka Gakkai into a grassroots global movement of empowered global citizens. His efforts include his pioneering personal diplomacy during the Cold War, ongoing dialogues with a broad range of individuals from around the world, numerous publications and proposals for the founding of unique peace-related institutions. In a nutshell Dr Daisaku Ikeda is a rare personality who witnessed and was moved by the devastation and senseless horror of Hiroshima and Nagasaki, as a teenager during World War II. His life long passion for peace and in rooting out the fundamental causes of human conflict have been my motivation to pursue Nonkilling and Nonviolence as the path to global peace. Is such a Nonkilling Society possible? A resounding “Yes!” is asserted in the Center for Global Nonkilling’s work. This is not a utopian vision. Nonkilling is aimed explicitly at actions for the betterment of fellow citizens, doing good through preventing injury/killing to self, others and group(s). The World Health Organization in its Report on Violence and Health in 2002 concluded that “violence is a preventable disease”, similar to the conclusion of Nonkilling Global Political Science. The very ethos and central tenet of Dr Daisaku Ikeda’s thought, and of Buddhism, is the fundamental sanctity of life, a value which Ikeda sees as the key to lasting peace and human happiness. Today in times of unprecedented global turmoil in the wake of terrorist attacks, be it Tokyo, Mumbai, New York, London, Paris or the Middle East and the modern nation states own retaliatory, at times spontaneous response has no end in sight. It is in this backdrop that Ikeda and his thought becomes ever so relevant. my dear and treasured friend! of one eternally victorious, …. In gratitude to Sensei Dr Daisaku Ikeda, I take this opportunity to foster a ‘Nonkilling World View’ in infinite reverence to life and universal peace, in my capacity as the Chairman of the Centre for Global Nonkilling at Hawaii on a clarion call given by its founder Professor Glenn D Paige. This idea, so well-articulated by Ikeda himself, nonkilling and nonviolence is indeed the call of the day as the only sane way forward lies in the Gandhian dictum “to fight darkness, you need light’. The precept so well propounded in Ikeda’s own thought, global peace and harmony relies ultimately on a self-directed transformational change within the life of the individual, rather than on societal or structural reforms alone. This idea is expressed most succinctly in a passage in Ikeda’s best-known work, ‘The Human Revolution’, whence Ikeda’s novelization of the Soka Gakkai’s history and ideals lead us to a better understanding of his approach in reverence to life, “A great inner revolution in just a single individual will help achieve a change in the destiny of a nation and, further, will enable a change in the destiny of all humankind.” I quote, one of the most revered former Presidents of India Dr Abdul Kalam, with whom I was fortunate in sharing these very thoughts over a couple of days during the National Youth Festival in the year 2000, “We are all born with a divine fire within us. 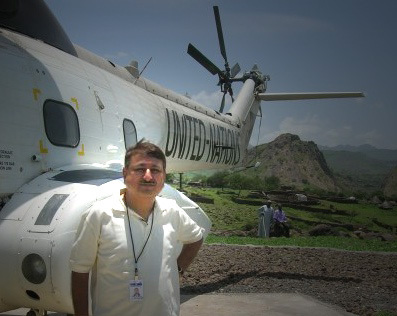 Our efforts should be to give wings to this fire and fill the world with the glow of its goodness”. Indeed, ‘Nonkilling’ refers not only to the absence of killing, but also threats to kill, and conditions that lead to killing in human society. Even though the use of the term in the academic world refers mostly to the killing of human beings, it is sometimes extended to include the killing of animals and other forms of life. This is also the case for the traditional use of the term “nonkilling” as part of Buddhist ethics, as expressed in the first precept of the ‘Panchasila’, and in similar terms throughout world spiritual traditions. Significantly, “nonkilling” has also been used in the “Charter for a World without Violence” approved by the 8th World Summit of Nobel Peace Laureates. In his book ‘Nonkilling Global Political Science’, Glenn D. Paige estimated that less than 0.5 percent of all humans that ever existed actually killed other humans. Also, anthropological evidence points out that in certain societies and cultures killing is down to statistically insignificant levels. As humans lived exclusively as hunter-gatherers, epitomizing the attributes of a nonkilling society the levels of violence and killing have also been very low during most of the history of Homo sapiens sapiens and are a natural and inborn genetic trait in contrast to popular notion and belief. I may mention that Nonkilling does not set any predetermined path for the achievement of a killing-free society in the same way as some ideologies and spiritual traditions that foster the restraint from the taking of life do. As an open-ended approach it appeals to infinite human creativity and variability, encouraging continuous explorations in the fields of education, research, social action and policy making, by developing a broad range of scientific, institutional, educational, political, economic and spiritual alternatives to human killing. Also, in spite of its specific focus, nonkilling also tackles broader social issues. In relation to psychological aggression, physical assault, and torture intended to terrorize by manifest or latent threat to life, nonkilling implies removal of their psychosocial causes. In relation to killing of humans by socioeconomic structural conditions that are the product of direct lethal reinforcement as well as the result of diversion of resources for purposes of killing prevalent in modern times, nonkilling implies removal of lethality-linked deprivations. On issues of environmental degradation, global warming and threats to the viability of the biosphere, nonkilling presupposes not only absence of direct attacks upon life-sustaining resources but also cessation of indirect degradation associated with such lethality. In relation to forms of accidental killing, nonkilling implies creation of social and technological conditions conducive to their elimination. In analysis of its causes, nonkilling encompasses the concepts of peace i.e. absence of war and conditions conducive to war, nonviolence i.e. psychological, physical, and structural, and ahimsa i.e. noninjury in thought, word and deed. While the usage of terms such as “nonviolence” and “peace” often may imply passivity, nonkilling is a more proactive approach that can be quantified and related to transformational change for the progressive eradication of killing. Thus in a broad conception, nonkilling opposes aggression, assassination, autogenocide, contract killing, corporate manslaughter, cultural genocide, capital punishment, democide, domestic killings, ethnic cleansing, ethnocide, femicide, feticide, gendercide, genocide, honor killing, ritual killings, infanticide, linguicide, mass murder, murder–suicide, omnicide, policide, politicide, regicide, school shootings, structural violence, suicide, terrorism, thrill killing, tyrannicide, violence, war, and other forms of killing, direct, indirect or structural. The concept of nonkilling combines the ancient Asian yin-yang symbol with the recent researches that find that stimulation of the pathways of the brain controlling emotions and movement can assist change from violent to nonviolent human behaviour. Analogously Creative Transformational Initiatives drawing upon Nonkilling Human Capabilities can bring an end to Human Killing. Forever in nonkilling and peace, eternal betriumph of god’s might.